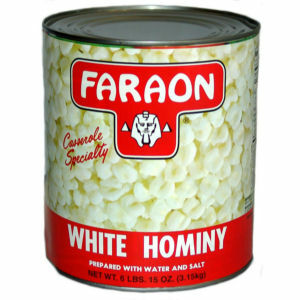 Faraon White Hominy, "maiz blanco"... is as white as snow. Faraon is enjoyed by all true corn lovers and can be a nutritional ingredient in unlimited varieties of meals, but is especially delicious with "menudo" and "pozole". In a large size can, this is a traditional family favorite. Delicious and tender, Faraon quality is always guaranteed.